For anyone who’s followed Pacific Northwest Ballet throughout the years, it’s pretty much impossible to forget former principal Ariana Lallone. She’s been a mysterious peacock in Nutcracker; a burst of joy with swaying hips in Lambarena; and a seductive Emilia in The Moor’s Pavane. Quite frankly, there is no one like her, and it’s not just because she’s 6’5” en pointe. First of all, she’s incredibly humble. Along the road to to the top tier of PNB, she learned many roles that she would never perform, and was told very quickly that she could be a Lady Capulet, but never a Juliet. No problem for Lallone: to this day, she speaks only with gratitude for the opportunities she has been given, and the treasure trove of memories from her ballet days extends deeply. Perhaps it’s this very humility that makes Lallone such a captivating performer. Instead of ego, she brings a 100 percent commitment to the work, and, as a result, she captivates, moves and seduces audiences with ease. While she left PNB after an incredible 25 years in 2011, Lallone was by no means retiring as a dancer. Now the resident ballerina of numerous Teatro ZinZanni productions, including the current Hacienda Holiday, performing is just one aspect of this dancer’s busy life today. Ariana Lallone in Hacienda Holiday at Teatro ZinZanni. SeattleDances: In Hacienda Holiday, you perform barefoot as well as en pointe (and in the air!). 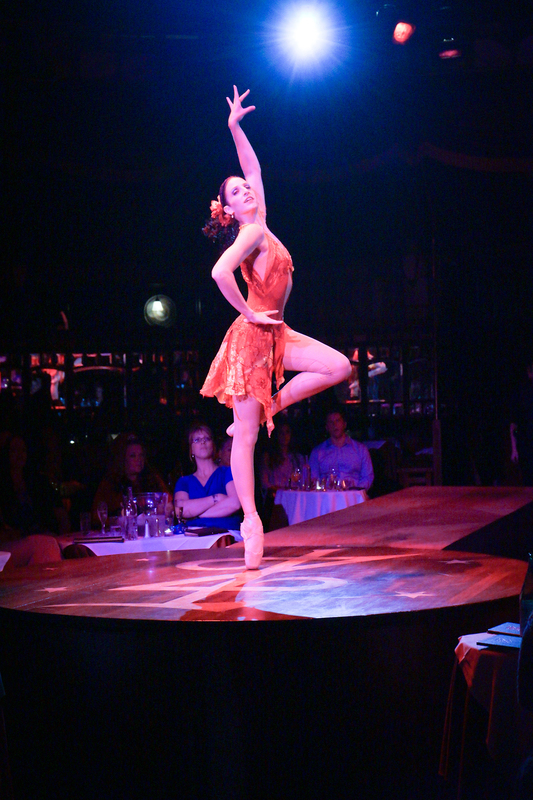 How has your act evolved at ZinZanni? Lallone: The first one I did, Bonsoir Liliane! was just pointe work. I had no idea what it was going to lead to; I only knew I was a fan of the tent. So that first show, it was kind of like, “Oh my God, I can’t believe I get to work with these people!” And then it became, “Man, I want to do something else, something a little more physical.” There’s little traveling you can do on pointe in a 9-foot circle. So I had this crazy idea that I wanted to do a grande jeté over peoples’ heads. I didn’t want it to look like I was trying to do aerial work, though. I choose a lyra (aerial hoop suspended in the air) to take on what a partner would do. After I introduced [my pointe/aerial piece] in Dinner at Wotan’s, I wanted to continue experimenting and being able to do something more musically stylized, as well as have a relationship with the floor and air. SeattleDances: You play a spicy Latin sorceress in the show, a very Ariana Lallone-ish role. Do you like being typecast? Lallone: I’m hardly going to complain about it. There’s a lot of texture and theatricality that goes into those kinds of roles. I worked my way into them, and I love them. SeattleDances: Where’s the line between art and entertainment in your new circus realm? Lallone: With ZinZanni, it’s always about love, laughter, levity and making people feel good. But we’re all artists, as well as entertainers. SeattleDances: Why was it important for you to keep performing after PNB? Lallone: I knew that it was going to be my last year at PNB, and I was emotionally unprepared for that. It was all about the end, the end, the end—the last time I’d be performing this or that. Performing is what I do, but the way I was doing it was no longer going to be possible. I realized that it couldn’t be the end for me. I love entertaining. I continue to enjoy it. Right now, I’m performing in five or six shows a week. SeattleDances: You look fantastic. What’s the secret to being able to dance for years? Ariana Lallone at Michael Doucett’s photography studio. SeattleDances: How nice for your PNB pals to be able to spend time with you. Lallone: And for me too. It’s an amazing life. And the city is an amazing place to live. I’m very, very lucky. To be able to stay here, it’s really important to me. People talk about how hard it is [to leave PNB] for the artistic side, but it’s hard to leave the social side of it, too. SeattleDances: Tell us a bit about your teaching. Lallone: I believe ballet technique is a form of exercise. I teach small group classes about five days a week and really, it’s basically a ballet class. It’s unbelievably rewarding to see people pushing their bodies. The class is very hands-on—very intimate and I have time to really pay attention to all of my students. Everytime I walk out of there, I can’t believe how much someone has grown or how far someone has pushed themselves. I’ve had the opportunity to grow a lot as a teacher, too. SeattleDances: What’s on the horizon for you? Lallone: I’d love to keep expanding on what I’m doing now. I’d love to do another show at ZinZanni. I hope to keep teaching (I also work with private clients whether it’s a kid who’s an acrobat, or someone who’s always wanted to learn how to dance). I love having that one-on-one connection with someone, and I give 150 percent of myself. SeattleDances: Have starstruck PNB fans ever approached you during ZinZanni shows? Lallone: Yes, it’s one of the wonderful things I do not take for granted. When someone walks up to me and says, “I remembered you in this,” or “We miss you,” it’s so kind. People are very heartfelt and honest with their emotions, and I’m grateful. SeattleDances: Many people reading this are dancers. What advice do you have for us? Lallone: Stay hungry. Stay positive. Be consistent. Have confidence in yourself, but also be open and accepting. Remember there is always room for improvement. The main thing I’d say is, enjoy it. Ariana Lallone performs in Hacienda Holiday from now until January 31 at Teatro ZinZanni. For more information,go to zinzanni.com/seattle.